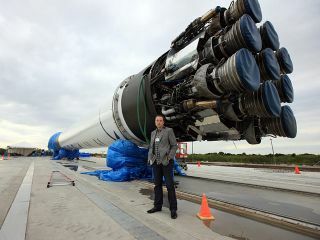 SpaceX CEO Elon Musk stands next to the company's Falcon 9 rocket, which blasted SpaceX's Dragon capsule into orbit in December 2010. The fevered speculation about billionaire entrepreneur Elon Musk's mysterious "Hyperloop" transport system is about to come to an end. Musk, the visionary behind electric-car firm Tesla and the private spaceflight company SpaceX, has said he will unveil a Hyperloop design on Monday (Aug. 12), after teasing the world about the superfast travel technology for more than a year. The solar-powered Hyperloop would allow passengers to get from Los Angeles to San Francisco in less than 30 minutes, Musk has said, meaning it must travel at speeds greater than 600 mph (966 km/h). The system would be cheap and convenient, he added, with tickets costing less than a seat aboard a plane or train and Hyperloop vehicles departing frequently from their various stations. Though we don't know exactly how the Hyperloop will work or what it will look like, Musk has dropped some hints since first disclosing the concept in July 2012. For example, this past May he described the Hyperloop as a "cross between a Concorde and a railgun and an air hockey table." Musk has shared some other news about the project lately, revealing that he probably won't have much time to develop the Hyperloop — at least not in the near future. "I have to focus on core Tesla business and SpaceX business, and that's more than enough," Musk said Tuesday (Aug. 7) during a conference call with Tesla investors, Gizmodo reported. During the call, Musk expressed hope that the worldwide community of engineers and inventors can make something happen with the Hyperloop design he puts out there. But he didn't close off the possibility of helping out in the future. "If nothing happens for a few years, with that I mean maybe it could make sense to make the halfway path with Tesla involvement," Musk said, according to Gizmodo. "But [what] I would say is, you shouldn't be speculative."